Earlier this month I ran the 2017 New York City Marathon and I have been struggling to write about it. It has been difficult because so many different emotions are swirling around inside me. I started out wanting to write about what a world-class event it was. I have never heard people refer to a race as being “world-class”. When people use this term, they mean that whatever they are referring to is the best of the best. The race organizers, the New York Road Runners (NYRR), have thought of everything when it comes to planning the race to ensure the runners have the best experience, all the way down to therapy dogs in the runners villages while we waited for each wave’s start. Never saw that before. Over the weekend there were a number of opportunities to meet and greet the elite runners, ones that I have watched and admired for years. I saw Bill Rodgers, Paula Radcliffe, and Ryan Hall on one panel. Afterwards I had an opportunity to talk to Bill. He chatted with me as if we were long-lost friends catching up on things. I listened to Joan Benoit Samuelson telling an audience of runners what to expect on each mile of the course. She pointed out different spots where it could be windy. She gave tips on how to handle the bridges, which are the real hills in the race. When I was running through Brooklyn, I remembered what Joan said about the winds and how to deal with them. Because of her tips, I remained focused as I ran. I can’t think of any other sport where professionals make this kind of connection with amateurs. With over 51,000 runners from 139 countries, it was like a runners version of the United Nations. There were flags from all the represented countries lining the course near the finish line. I rode the bus to the start on Staten Island with a group of runners from South Africa. As we waited in the cold and wind in the runners village, I shared space blankets and running stories with runners from California, France, and Switzerland. The camaraderie I experienced was special. We were all one big group of cold runners waiting to head to Central Park. Everyone was happy. The race director, Peter Ciaccia, understands the commitment people make to train for a marathon. He wants to ensure that every finisher, whether they are the first ones or the last, is cheered at the finish line. Peter has a tradition of being there for the final finishers, even if it takes them over 8 hours to finish. I have never heard of a race director of any race doing that. He was even joined by some of the elite runners. I want to go back and be one of the people cheering for those final finishers. When I couldn’t get too far with the “world-class” idea, I started thinking about November and how it is the month of giving thanks. There were so many times over marathon weekend when I was thanking someone. This race required a lot of volunteers – 12,000 volunteers who worked the Expo, stood for hours on their feet at water stops along the course in the cold rain, or guided exhausted runners at the finish. There were the hundreds of police and military personnel who protected the runners from the runners village all the way to Central Park. Without them and the volunteers, there would be no marathon. I thanked them all as I ran by. 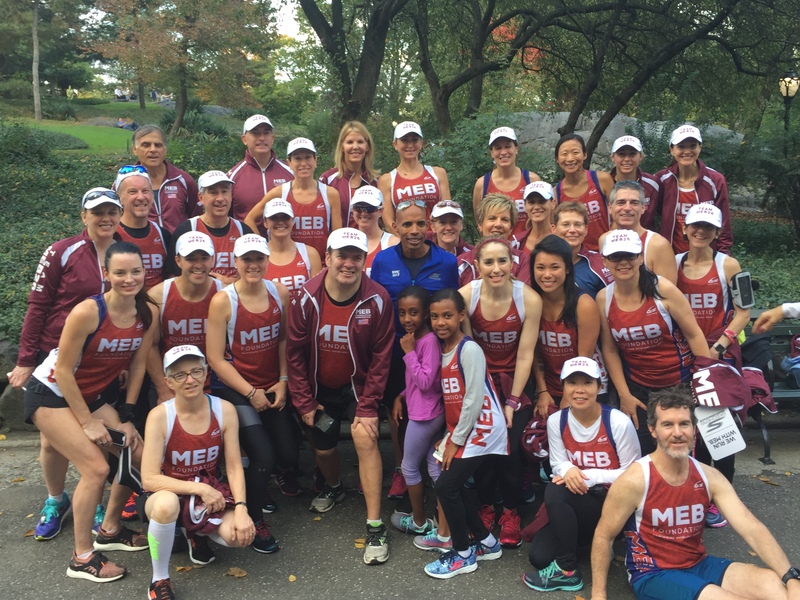 As a member of the MEB Foundation team, I thanked Meb Keflezighi for inspiring us by his incredible marathon performances, especially the win we all will remember – the 2014 Boston Marathon. I also thanked him for showing us how someone can overcome adversity and achieve greatness. I think I was the only person who called him “Sir” instead of Meb. But to me, he is running royalty and informally calling him by his first name didn’t seem to convey the respect I have for him. There was Kathrine Switzer, the first woman to officially enter and complete the Boston Marathon, who was one of the speakers at a pre-race dinner I attended. Following her speech, I had an opportunity to meet Kathrine and thank her for making it possible for me to run a marathon. Without her there would never have been a funatical runner. But I still wasn’t happy with the direction my blog post was going. Then I received a gift that pulled it all together for me. 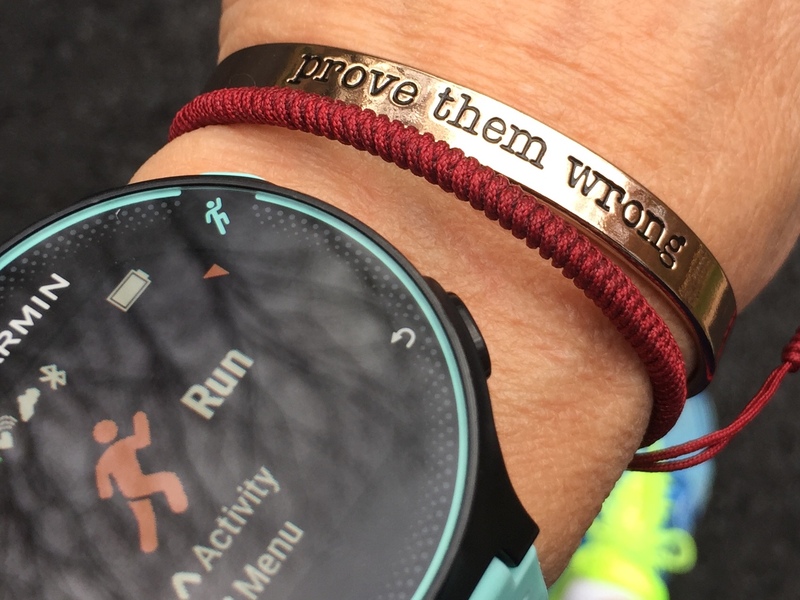 It is a bracelet engraved with the saying “prove them wrong.” Those three words define the accomplishments of so many of my running heroes. In 2014 no one expected Meb to be a contender for a podium finish in Boston. But he proved them wrong – he won the race. In 1967 no one believed that a woman could run a marathon. Women were too fragile; people actually thought women’s uteruses would fall out. Then a brave woman, Kathrine Switzer, entered the Boston Marathon and finished it (not without controversy). Kathrine proved them wrong. In doing so, she started a discussion that ultimately led to athletic organizations across the world to allow women to participate in running events longer than 800 meters. In 1984 the world watched the first women’s marathon in the Summer Olympics. A young woman runner from the United States passed up the first water stop on what was a hot Los Angeles day. I remember the commentators saying what a mistake it was. The other runners had all taken their hydration. Not Joan Benoit Samuelson. She kept going and ended up pulling away from everyone. Joan won the gold medal. She proved them wrong. She knew how to win. There is Shalane Flanagan. She had to withdraw from the Boston Marathon in April due to a fracture in her lower back. Coming into the race, Shalane said she was thinking about retirement. I understand. Training for marathons takes a lot of time – time you can spend with your family doing other things. Mary Keitany, a three-time New York City Marathon winner, was the favorite to win. But anything can happen on race day. Just like April 21, 2014 was Meb’s day, November 5, 2017 was Shalane’s day. Shalane proved them wrong. She proved she had what it took to win the race. Finally, there is Justine Galloway. Justine was running for Team Fox, Michael Fox’s foundation, and fundraising for Parkinson’s disease research. Justine isn’t a normal runner. She has a neurological disorder called runner’s dystonia. The only way Justine can run is to run backwards. 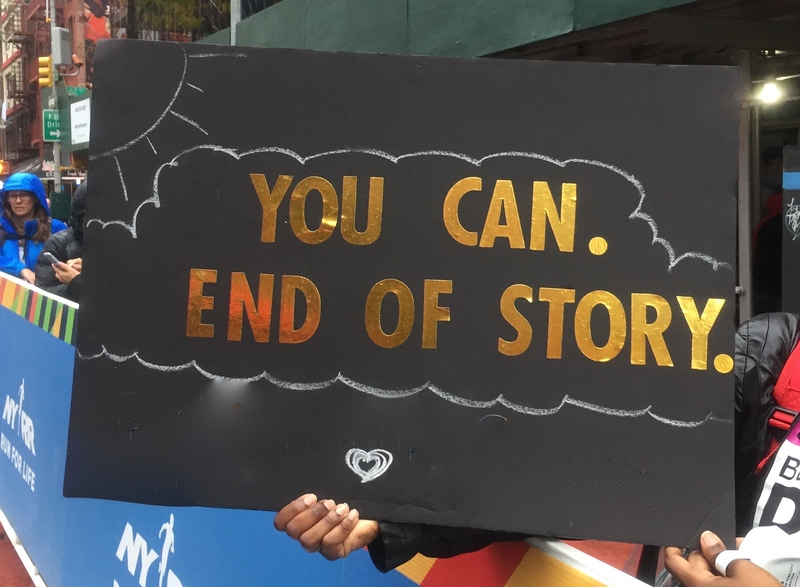 With the help of a guide, Justine completed the New York City Marathon. I am sure there were people who didn’t think she could do it. But Justine proved them wrong. They say the New York City Marathon will move you. I went to New York expecting just to run another 26.2 miles through another big city. I didn’t think there would be anything special about it. But they proved me wrong. I came home with more memories than I ever expected to have. It moved me in ways I never thought possible. 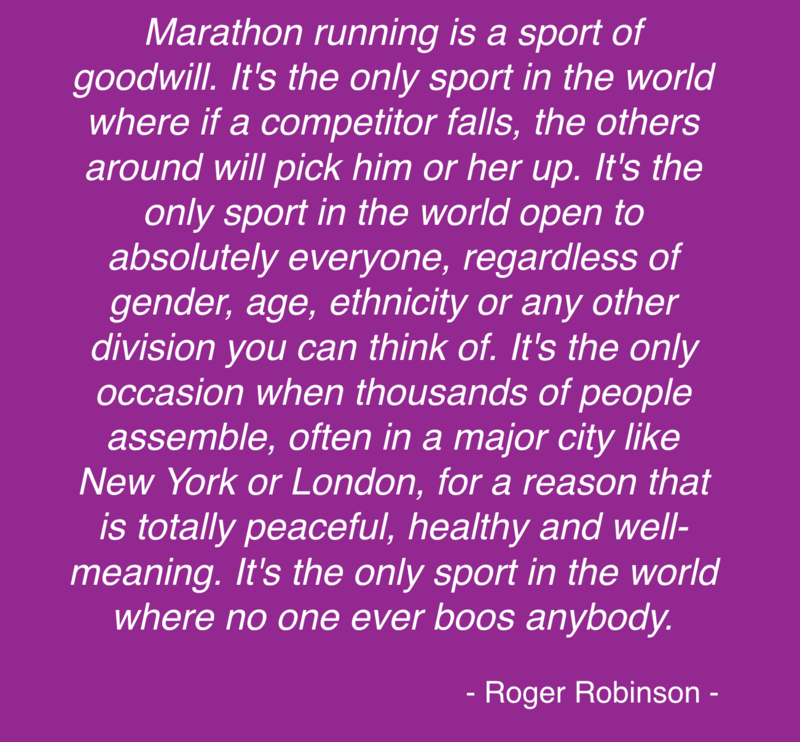 It is a very special race that every marathoner should run at least once. What a great post! I have heard nothing but good things about the NYC marathon and hope to one day run it myself. Thank you! I hope you have an opportunity to run it too. Good luck!